WASHINGTON, D.C. -- The great majority of Americans are in favor of more stringent regulation of the sale and ownership of guns in three ways that go beyond current law in most states. U.S. adults offer near-universal support for requiring background checks for all gun purchases, backed by 96%. Also, three-quarters favor enacting a 30-day waiting period for all gun purchases and 70% favor requiring all privately owned guns to be registered with the police. These findings come from Gallup's Oct. 5-11 Crime poll, conducted just days after 58 people were killed in a mass shooting in Las Vegas on Oct. 1 -- the deadliest mass shooting in modern U.S. history. In addition to the three proposals aimed at tighter gun regulations, the same poll also found Americans evenly divided on an assault weapons ban -- after opposing it last year -- and largely opposed to an outright ban on handguns. Although federal law requires background checks for most gun purchases, the so-called "gun show loophole" waives the requirement if the seller only sells guns as a side business. Some states have passed laws closing this loophole, but most have not. Still, gun owners match non-gun owners in support for making background checks a blanket requirement for gun purchases, with 95% and 96%, respectively, in favor. This is the first time Gallup has measured support for background checks using the current question wording. However, posing a slightly different question in 2015 that specified the law would use a "centralized database across all 50 states," Gallup found 86% in favor of universal background checks for all gun purchases. Additionally, a 1999 Gallup question that measured support for mandatory background checks, including purchases made at gun shows, found 87% of Americans in favor. Advocates of a 30-day waiting period for all gun sales argue that it would give law enforcement the time needed to conduct thorough background checks on prospective buyers, as well as thwart impulse crimes. However, there is currently no federal waiting period beyond the three days typically required for background checks, and only a handful of states plus the District of Columbia have their own waiting periods. Despite the major change that a mandatory 30-day waiting period would entail, a majority of gun owners (57%), as well as the vast majority of non-gun owners (84%), favor the proposal. This is the first time Gallup has measured public support for a 30-day waiting period. However, in 1981, shortly after President Ronald Reagan was shot in an attempted assassination, 91% of U.S. adults favored a proposed 21-day waiting period "to check to see if the prospective owner has a criminal record or has been in a mental institution." Gun registration is the only gun regulation proposal among the three tested in the latest poll on which gun owners and non-gun owners are on opposite sides. Although 70% of Americans favor requiring privately owned guns to be registered with the police, gun owners tilt against this -- 48% in favor and 52% opposed. At the same time, 82% of non-gun owners favor it. There is currently no federal gun registry, although a few states have implemented registration of some or all types of firearms. Americans broadly support three proposals for new laws that would make it harder for guns to get into the wrong people's hands, or that would allow law enforcement to track gun possession. 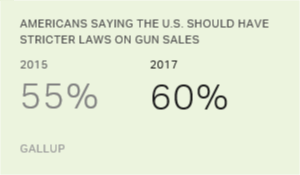 This comes at a time when public support for stricter gun laws in general is the highest Gallup has recorded in more than a decade. However, similar Gallup questions in the past about universal background checks, lengthy waiting periods and gun registration have produced similarly high public support. In essence, while Americans clearly want to maintain individuals' right to own guns -- evidenced by their widespread opposition to banning handguns -- they are perfectly amenable to asking gun purchasers to endure some inconveniences or even encroachment on their privacy in the interest of public safety. Passing laws requiring background checks for all gun purchases and 30-day waiting periods is theoretically viable, since even most gun owners favor these proposals. Enacting gun registration, on the other hand, is more daunting given the resistance by a majority of gun owners.